Only $250 Down and Monthly Payments as low as $145! OrthoFi allows us to offer low entry costs and monthly payment options. Be sure to talk to someone on our staff for the specific details. If you were an Invisalign product, which one would you be? Are you a Full? A Lite? Maybe a Teen or Express? Take our fun quiz to see what kind of Invisalign product you'd be based on your personality and lifestyle. At Milnor Orthodontics, we understand what a big deal it is to be considering orthodontic treatment, and we are honored that you have included us in your process. For those who have never been exposed to it before, and even for some who have, the world of orthodontics—from the types of treatment to the costs involved—often lands somewhere between overwhelming and downright frightening. Our mission at Milnor is to eliminate any concerns you may have before, during or after treatment. Give us a patient referral, and we’ll give you a FREE gift! When you reward us by sending a referral our way, we want to reward you back! Learn how you can receive a free gift by referring a friend or family member. When it comes to treating our patients, we think our staff is top-notch. Read more about them here or stop by to meet them, and we’re pretty sure you’ll agree. Think Invisalign is just for adults? Think again! 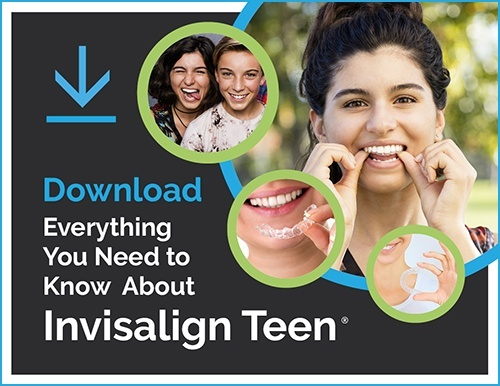 Invisalign Teen makes this bracketless, removable treatment option teen-proof! Give your son or daughter the smile they’ve always wanted without the hassle of braces.